As we end the week, let’s take a look at what China is doing to stimulate the economy. If the world has been worried about global growth, because of the toll that trade reform is taking on China, then the actions China has been taking, and has discussed overnight, should be THE focus for markets — in addition to the status of a U.S./China trade deal. Remember, by the end of last year, much of the economic data in China was running at or worse than 2009 levels (the depths of the global economic crisis). It’s clear that the era of double-digit growth in China is over (at the expense of the rest of the world). The question is, how low can it go, without threatening an uprising against the regime. They seem to be willing to do ‘whatever it takes’ to defend the 6% growth number. With that, as we’ve discussed, for a sustained recovery in global growth, expect others to follow the lead of the U.S. with big fiscal stimulus and structural reform (i.e. Europe, Japan …. and China). With the news overnight from Chinese Premier Li (who has been the pointman for U.S./China trade negotiations), China is preparing an assault on the growth slowdown. He’s promising an aggressive mix of monetary and fiscal stimulus. They are looking to do large-scale tax cuts. They’ve promised billions of dollars infrastructure spending. They’ve already cut the reserve requirement for banks five times in the past year – and they are looking to do more to motivate bank lending. And they are targeting to create 13 million jobs this year in the manufacturing sector and in small business. 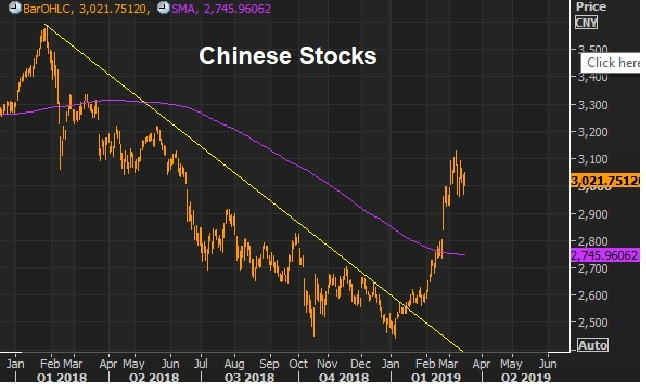 As we’ve discussed, Chinese stocks are reflecting optimism that a bottom is in for the trade war and for Chinese economic fragility. Join me here to get my curated portfolio of 20 stocks that I think can do multiples of what broader stocks do, coming out of this market correction environment.